Barbara is one of the founding members of Legacy Group. She has brought on board her administrative skill and real estate management skills that have made her a good steward of the Legacy Brand. 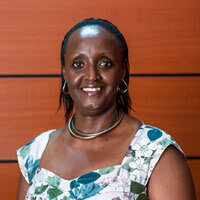 Barbara was instrumental in the development of the Legacy Brand and took on a number of roles under the Rutungu Investments Limited. Her enterprising leadership has helped Legacy Group to extend its reach throughout the country and the region as a whole.